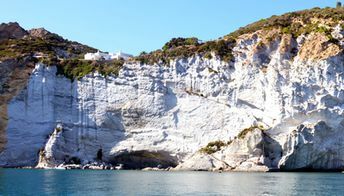 This beach ranks #10 of the "Best beaches in Ponza island"
In Cala Inferno, there are several hotels with rooms' rates ranging from US$80 to US$200 per night. However, anyway it is not possible to walk down to the beach. Fly to Rome airports of Fiumicino (FCO) or Ciampino (CIA). Take a train to Anzio, Terracina, Formia or to Naples, and next get to Ponza island by ferry or by hydrofoils / aliscafo. Then take a boat to the bay of Cala Inferno. However, the south end of the bay can be reached by land, but there is nothing interesting. The best time for a beach holiday in Cala Inferno is a warm period in the summer half of the year.